Aaron McCarey feels he has "a point to prove" when he makes his loan debut for Portsmouth against Bristol Rovers in League Two on Saturday. 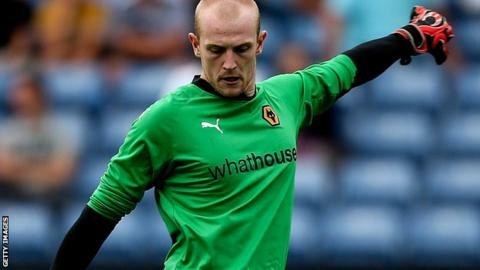 The 23 year-old goalkeeper signed a one-month emergency loan deal from Wolves on Thursday. He goes straight into Paul Cook's side due to injuries to fellow keepers Paul Jones, Brian Murphy and Michael Poke. "It's a great opportunity for me where I'm hoping to help Portsmouth out," he told BBC Radio Solent. Former Walsall and York City loanee McCarey has not played a first-team match in more than a year so was delighted to answer the call to help Pompey out. "Once I heard Portsmouth were interested, I wanted to come straightaway," he said. "I need a run of games and I've got a point to prove to a couple of people, so I'm really looking forward to it. I'm really happy to be at a club of this stature and I'm really looking forward to getting going."